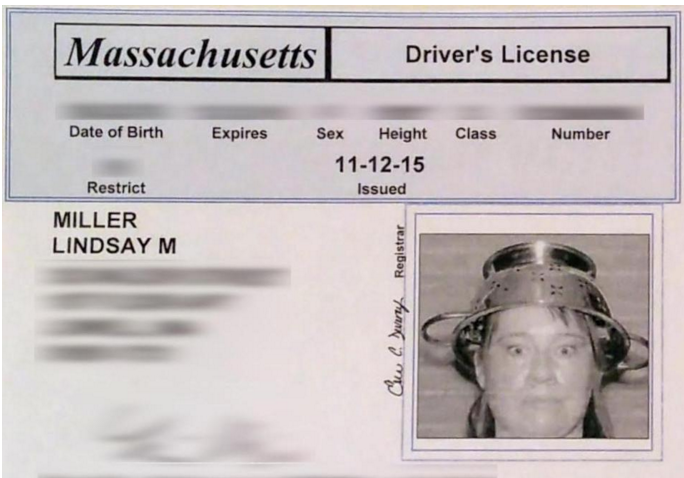 The Boston Globe has a nice story about a Pastafarian lady’s successful efforts in wearing a colander in her driver’s license photo, helped by the American Humanist Association. In August, the Lowell resident was denied a renewed license by the Massachusetts Registry of Motor Vehicles, she said, for wearing the metal cookware. Miller filed for an appeal immediately after the August incident. Through a friend, she enlisted the help of Patty DeJuneas, a member of the Secular Legal Society, a network of lawyers that assist the American Humanist Association. You can read more about it at the Boston Globe here. I feel like our efforts to wear Religious Headwear in Offical Identification may be misunderstood occasionally (this Boston Globe article caused more than few upset emails). I wish that it was more clear that the Church of FSM is not a mean-spirited group and that we’re not out to mock anyone’s particular religion or their religious hats. It is just that it’s weird to find these places where bureaucratic regulation and religion are entangled — and I hope that we’re doing more good than bad when we fight for equal right to use these rules. I realize that we may inadvertently offend a few religious people (and maybe annoy a few bureaucrats) and for that I’m sorry. We can all look forward to the day when Pastafarians feel it’s socially acceptable to wear religious headwear in our daily lives. I live in Florida and I got my permit today and I was allowed to wear my colander for my photo. It was great one of the workers help me and was learning about pastafarian Amateur the day before.